Following the instructions … that Jesus had given was a matter of life or death for the Christians living in Jerusalem after He returned to heaven. He had been specific: “But when you see Jerusalem surrounded by armies,… let those in Judea flee to the mountains, let those who are in the midst of her depart, and let not those who are in the country enter her” (Luke 21:20-21). At the end of A.D. 66, after Cestius and his soldiers had surrounded Jerusalem to conquer it, they withdrew for no apparent reason. Those who cherished the Saviour’s instructions used this opportunity to escape. That is why, when the city was destroyed by the Romans in A.D. 70 and more than one million people in the city perished, not one Christian was among them. 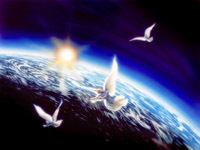 “Then I saw another angel flying in the midst of heaven, having the everlasting gospel to preach to those who dwell on the earth–to every nation, tribe, tongue, and people–saying with a loud voice, ‘Fear God and give glory to Him, for the hour of His judgment has come; and worship Him who made heaven and earth, the sea and springs of water’” (Revelation 14:6-7). 1. What does this angel have for the world? The everlasting gospel is the good news of Christ’s loving service and sacrifice to reopen the gates of paradise to all who choose to escape eternal death. The message of His life, teachings, death, resurrection, and ascension will reach every person on earth before Jesus returns. Matthew 24:14. 2. What two “present truth” messages does the first angel emphasize? a) “The hour of His judgment has come.” Lesson 9 presents God’s judgment as beginning at the end of the prophesied 2,300 years, in 1844. The fact that the angel speaks in a loud voice implies importance and urgency. The Lord will soon return to earth. Our acceptance or rejection of the gospel will determine our destiny for eternity. b) The theory of evolution–that everything on earth is a product of chance–is proclaimed as fact in schools from kindergarten through university, in magazines, in God-defying books, in natural history museums, in the media, in taxpayer-supported institutions, and even in churches. We are nevertheless instructed to worship the Creator of everything, as presented clearly in His Word. 3. What does Jesus urge us to do? Nothing should distract us from our primary focus–the judgment and His soon coming. By inviting the Creator, Saviour, and Sustainer into our hearts and lives, we allow Him to cleanse and prepare us to spend eternity in paradise with Him. He is “not willing that any should perish” (2 Peter 3:9). “And another angel followed, saying ‘Babylon is fallen, is fallen, that great city, because she has made all nations drink of the wine of the wrath of her fornication’” (Revelation 14:8). 4. Where did the concept of “that great city,” Babylon, originate? If we look back at the builders of the ancient city of Babel, constructed a little more than a hundred years after the flood of Noah’s day (Genesis 11:1-9), it becomes clear that they had a great deal of knowledge. God said that the builders of Babel were in a position to accomplish anything they might imagine. Genesis 11:6. They proved by their actions that they could not be trusted to handle such great knowledge properly, so God put a stop to their plans by confusing their language. And Satan continues to confuse–to combine–pagan and Christian doctrines for people who despise truth. 2 Thessalonians 2:8-11. In the book of Revelation, a pure woman represents God’s true church. (See Lesson 19.) In Revelation 17, a harlot called Babylon the Great symbolizes the fallen church. Babylon, then, means “confusion” and therefore encompasses the Roman church and those Protestant churches that have combined falsehood with truth. 5. What does the “fall” of Babylon represent? Continuing with the symbolism of Revelation, a woman “falls” when she voluntarily submits to a man other than her husband. A city is considered fallen when it can no longer repel its enemies. And a church falls when it (1) stops taking directions from its “husband,” Christ, and mixes paganism or its own imaginations with pure doctrine; (2) turns to civil government for protection and power; and (3) persecutes Christ’s messengers. Matthew 23:37-39; John 19:14-15; 1 Kings 19:10. 6. What is the “wine of the wrath of her fornication” that Babylon makes all nations drink? Wine causes the mind to become confused, and so do false doctrines commonly taught among churches that claim to be Christian, including teachings such as the immortality of the soul, Sunday sacredness, spiritual oppression, and the worship of human beings. Matthew 23:8-12. 7. What will finally happen to Babylon? “Then a mighty angel took up a stone like a great millstone and threw it into the sea, saying, ‘Thus with violence the great city Babylon shall be thrown down, and shall not be found anymore’” (Revelation 18:21). 8. But what will God do before He judges Babylon? “And I heard another voice from heaven saying, ‘Come out of her, My people, lest you share in her sins, and lest you receive of her plagues’” (Revelation 18:4). This call to come out is evidence that in the world and in churches that stopped following God a long time ago there are many God-fearing men and women who are not lawless and sinful. When the time is right in His divine plan, God will call these people from the fallen churches–to join with His commandment-keeping people (John 10:16) and to, in their lives, reveal a risen Saviour to the world. 9. What is the “wine of the wrath of God, which is poured out full strength”? “Then I saw another sign in heaven, great and marvelous: seven angels having the seven last plagues, for in them the wrath of God is complete” (Revelation 15:1). These seven plagues are described in Revelation 16. 10. What does it mean that those who are thus punished have “no rest day or night” (referring to to Revelation 14:9-11, quoted under the heading “The Third Angel’s Message”)? “Come to Me, all you who labor and are heavy laden, and I will give you rest” (Matthew 11:28). Those who accept the mark of the beast have chosen to separate themselves from Christ. Without Him there can be no rest, much less during the plagues. Having no rest also refers to rejection of God’s rest, the true, Biblical Sabbath. 11. Who will be the overcomers in this struggle against the mark of the beast? a) Patience: “In your patience possess your souls.” “Therefore be patient, brethren, until the coming of the Lord” (Luke 21:19; James 5:7). Without patience it is impossible to obey God in the face of insult and threats. b) Obedience: “Blessed are those who do His commandments, that they may have the right to the tree of life, and may enter through the gates into the city” (Revelation 22:14). They obey God rather than men. Acts 5:29.
c) Faith of Jesus: As the apostle Paul writes, “The life which I now live in the flesh I live by the faith of the Son of God, who loved me, and gave Himself for me” (Galatians 2:20 KJV). Those who love and admire Jesus will have the same mind as He who delighted in doing His Father’s will. 12. When the victory is won, what will the victors enjoy? “And I saw … those who have the victory over the beast, over his image and over this mark,… standing on the sea of glass, having harps of God. And they sing the song of Moses … and the song of the Lamb” (Revelation 15:2-3). When Moses led the people of Israel out of Egypt, they came to a point where they were trapped; and it appeared that they would be destroyed by their enemies. But God delivered them by providing a path through the Red Sea. Similarly, it appeared that Christ was defeated when He died on the cross; but His death actually defeated Satan. So it will be again; when it appears to the saints that the wicked are about to destroy every last vestige of goodness, Jesus will come in the clouds. Then all the saints will understand more of God’s ways–and love the song of victory that will resound throughout the endless ages. What about … THE MARK OF THE BEAST? • How can you and I remain faithful under a pressure so terrible as that of the enforcement of the mark of the beast? “Perfect love casts out fear” (1 John 4:18). If we accept the gospel and maintain a constant, deep relationship with God, we will live in the presence of God and His holy angels right here on earth. They will encompass us more securely than if we lived in a walled fortress. We will constantly grow in grace, learn more and more about Jesus’ love (past, present, and future), and fix our attention on eternal realities. Our love for the Saviour will be so deep and strong that all our fears will be overcome. And when we love to search the Holy Scriptures and to live in obedience to God now, we will trust Him, not ourselves. Our attention will be so riveted on Him that the threat even of death under the mark of the beast will have no influence over us. Now is the time to practice trusting Him in both big and little matters; and then we won’t need to fear for the future. • Why do some people insist that the mark of the beast is a computer chip implanted in a person’s hand or forehead? Computer-chip stories, like the idea of the beast being a computer in Brussels, are smokescreens to draw people’s attention away from the much larger issue: God’s law vs. man’s law. The mark of the beast is no more visible than is the seal of God (which we’ll look into in Lesson 24). The universe can readily see whom we love by the day we honor. Matthew 7:16-18, 21; 15:9. Almost everyone likes going to a wedding–right? And each guest wants to be sure to wear “just the right” outfit. But have you ever seen an invited guest show up at a wedding in street clothes? See Lesson 23 for the description of “The Wedding Garment” that God offers. fear God, because it is time for the judgment. pay attention to nations, tribes, and peoples. churches in our time that teach a mixture of pagan and Christian doctrines. the tower builders of ancient Babel. confuses people with false doctrines. stopped taking directions from Christ. 5. Before Babylon is destroyed, what will God do? Call people out of Babylon to join with His commandment-keeping people. 6. What is the message of the third angel? If we drink the wine of Babylon, we will also drink the wine of God’s wrath. Those who receive the mark of the beast will also receive the seal of God. If we worship the beast, we will be tormented. 7. What is the 'wine of the wrath of God'? 8. What characteristics will the overcomers have? Patience, obedience, the faith of Jesus. The faith of Jesus, obedience, fear.